An urban garden that will provide nourishment while nurturing the environment is taking shape at a school in Hanwella with support from Teejay Lanka PLC under the company’s flagship environmental project ‘Mihikathata Adaren’ (To Earth with Love) with the help of volunteers of Blue Marble 6.0 representing AISEC Kandy. One of the region’s largest textile manufacturers, Teejay has extended this initiative to the Rajasinghe Central College, to cultivate food crops for the consumption of its students. The 50-perch garden will have approximately 200 vegetable plants and 30 fruit trees provided by Teejay, which has also undertaken to support the project with funding. Once the garden is productive, its yield would be enjoyed by about 50 students resident in the school’s hostel, the company said. Employees of Teejay Lanka will work with the school’s students, parents, and teachers to create and sustain the garden. The company has also pledged to monitor progress and provide required additional support throughout its first year. Guidance is to be provided by the Department of Agriculture on urban agricultural techniques that will benefit the garden. Blue Marble 6.0 is the summer initiative of AISEC Kandy, launched with the vision of increasing awareness on environmental conservation. AISEC is a non-governmental not-for-profit organisation in consultative status with the United Nations Economic and Social Council (ECOSOC). The ‘To Earth with Love’ program was initiated in 2014 and became a National Winner of the Energy Globe Award in Sri Lanka. The Urban Garden initiative at Rajasinghe Central College is the fourth such environmental initiative implemented by Teejay Lanka with school children. In past years, the program concentrated on reforestation activities by distributing trees to be planted to students and by conducting environmental awareness programs. 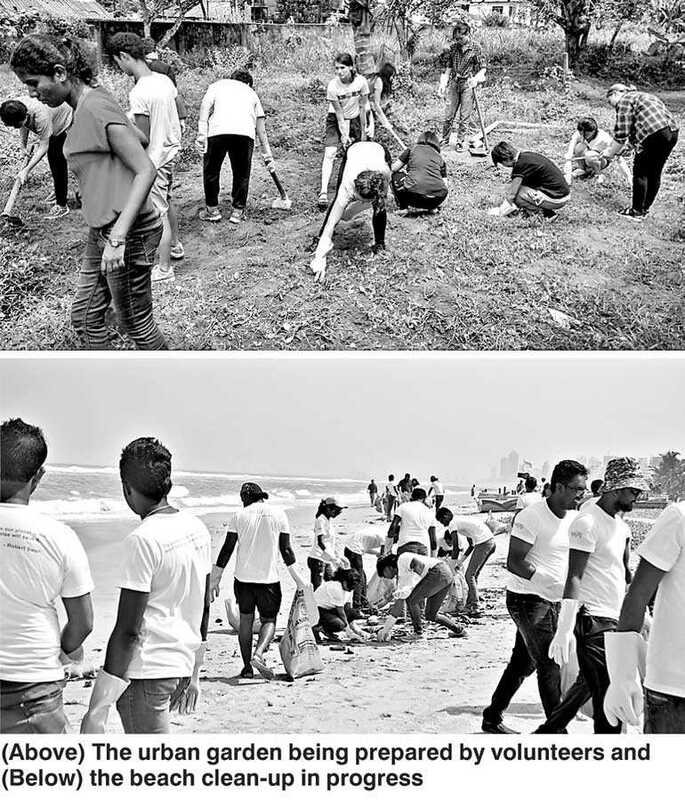 Teejay Lanka also recently conducted a beach clean-up in Mount Lavinia with the participation of its employees and selected local celebrities as part of its environmental responsibility initiative. This move will prove beneficial to beach tourism and the leisure activities the area is known for, the company said. Teejay Lanka’s own environment sustainability agenda focuses on two key areas: control of Greenhouse Gas (GHG) emissions and Waste Management. GHG control includes raising stakeholder awareness, reforestation, afforestation, engaging with environmental movements such as the Wildlife and Nature Protection Society (WNPS), rainforest protectors and related sustainable initiatives on GHG emission reduction through process innovation. The company has a long-term vision for waste management, involving the participation of communities in its neighbourhood, which are also the key beneficiaries of Teejay’s CSR initiatives. Teejay also focuses on eliminating hazardous chemicals in its processes and is the first company in the industry to introduce a carbon neutral fabric. Sri Lanka’s only multinational textile manufacturer, Teejay supplies fabric to some of the best international brands across the world. Teejay Lanka PLC is a public quoted company with 39 per cent public ownership. The company is backed by Sri Lanka’s largest apparel exporter, Brandix Lanka which has a 33% stake and Pacific Textiles of Hong Kong which owns 28% of the company. Teejay has been listed on the Colombo Stock Exchange (CSE) since 2011 and was included in the S&P Top 20 Index in Sri Lanka last year. The Company has also been named among the Forbes ‘200 Best under a Billion in Asia’ and been recognised as the ‘International Textile Firm of the Year’ and the ‘International Dyer and Finisher’ by World Textile Institute, London.